There is no doubt that the second trimester of 2012 will be a period of advances in the electoral realm. One of the cases that we mentioned in one of the last posts from last year is the Presidential election in Dominical Republic, which will take place next May 20th. The Central American country has been leading the crusade for e-voting for many years. After many attempts, and the denial of implementation of a pilot plan in 2006, the possibility of automating scrutiny has become a reality. It represents the first step towards the automation of the whole process for the 2016 elections. Having overcome many obstacles, the president of the country’s Central Electoral Board, Roberto Rosario, announced the automation of scrutiny and gave details about the technology that will guarantee the transmission of voting results from different points of Dominican Republic. France will also be under the spotlight during the second trimester of 2012. On April 22nd, the elections for this European nation’s president will take place, and the second round is scheduled for May 6th. Then, on June 3rd, the first round of the legislative elections will be held, with a second round scheduled for May 17th. 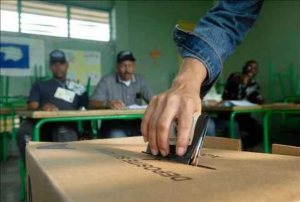 While Dominican Republic advances towards electronic voting, elections in France will still be manual. The automated voting system solves many inconveniences that the manual method has accumulated. Automation entails auditability (the possibility for the system to be evaluated in all its stages), and offers technological alternatives to recognize attempts of fraud. Besides, it guarantees security in the tabulation and sum of results, and cuts human error by a great percentage. In the case of elections through manual voting, procedures are managed 100% by citizens and are registered in paper, so security measures are focused on the physical safeguard of the electoral kit. Irregularities such as the tampering of the electoral material, loss or deterioration, transportation problems and the exposal to human error are possible and usually happen. If there were any doubts about the need to adopt electronic voting in Puerto Rico, the elections of March 18 should have cleared them. In these elections, which had the participation of candidates of the Partido Nuevo Progresista (PNP), Partido Popular Democrático (PPD) and the United States Republican Party, the typical failures of manual elections came to the forefront, failures which have led a growing number of countries around the globe to consider the implementation of electronic voting. Defects in the printing of materials, errors during counting, problems in the transcription of the voting lists, violations of the electoral safety norms; these are some of the many allegations the Puerto Rican State Commission for Elections (CEE) will have to answer to in order to avoid conflict, and to give these elections and their results a minimum of credibility. This regrettable episode could have been avoided, and its probable reiteration in future elections was what motivated the CEE to open a bidding process in order to select a company to fully automate future electoral processes in the Caribbean island. This bidding gave Puerto Rico the chance to become a leading country in electoral matters, like Venezuela and Brazil. Now, in order to have efficient and transparent elections, automation alone is necessary but not sufficient. A series of conditions must also be met so that the elections are carried out in such a way that makes the citizens at ease and aware that the results are a faithful representation of the will of the people. First, there needs to be a transparent and open bidding process that clears any doubt there may be about the qualifications of the company that’s chosen. It’s also necessary to have electoral authorities with a proven track record of technical and managerial skills, and who also have credibility with the general public. Last, but not least, it’s imperative to hire a company with cutting-edge technology and proven experience in the deployment of automated electoral solutions. Recently, there have been electoral incidents that show the inconveniences that arise when this combination of factors doesn’t take place. In Jalisco, Mexico, the electoral authorities granted a contract to a company with no experience in elections. This company (Pounce) hasn’t met the deadlines for the deliveries of the voting machines, therefore holding back the election calendar and generating mistrust about the bidding process and the capabilities of the electoral authorities. Just a few weeks ago in Palm Beach County, Florida, US, the electoral committee announced and certified several wrong candidates as winners. The root of this very embarrassing mistake was the lack of synchronicity between the candidate lists made with software by the company Dominon Voting System, and the ballots. The electoral authorities of the county are now in a dispute with the technology supplier, trying to elucidate who is to blame. No matter where the responsibility lies, the seed of doubt has been planted and the credibility in future electoral processes has been severely damaged. Regrettably, there are already doubts in Puerto Rico as to the capability of Unisyn Voting Solutions to carry out an election process with the degree of trust the Puerto Rican people deserve. The company that was chosen presented the most expensive offer during the bidding process and has no previous experience in elections. There are appeals filed in the First Court of San Juan to halt the signature of the contract with this company, which specializes in horse betting software. Let’s hope that the experiences of Jalisco or Palm Beach County won’t happen again. Puerto Rico still has the chance to rectify this situation and develop an electoral culture that makes its people proud. E-voting has earned the trust it needed, thus preparing the field for more and more nations to decide to work on its implementation. The cases of Colombia and Russia (to name a few), where the necessity of automating elections to offer electoral guarantees to their citizens has become clear, are already well known. However, it is fair to clarify that there are aspects that must be kept in mind in the way an automated system is implemented, as well as the conditions of the nations,. Recently in Palm Beach County, Florida, the electoral body declared victory for many candidates. Some days later, it was found out that other candidates were the actual winners. The election supervisor, Susan Bucher, stated that Dominion, the company in charge of the automation of the process, was at fault. The problem was a lack of synchronization between the lists of candidates and the Dominion software, which is why there was an error in the identification of the scrutiny. In order to avoid this kind of critical flaws —imagine how it must be to declare a candidate President and one week later having to say the real winner is somebody else—, countries must evaluate very carefully the companies in charge of implementing e-voting. It is very important that the selected company has a successful track record and precise, safe and reliable technology. To that end, a wide and clean bidding process must be guaranteed. We recently wrote about the case of Jalisco, Mexico, where the electoral power granted a contract to an inexperienced company (Pounce), and it took more than a month longer than expected only to deliver the machines. In order to carry forward a clean and efficient bid for e-voting, experts recommend normative, technical and organizational conditions which they deem essential. Some of them are: a public bid, which allows as many companies as there can be in the field to compete; the consideration of proven experience in the area, the inclusion of printed voting receipts in order to guarantee suffrage auditing, and the request for updated security norms for the systems. On the other hand, there are nations (less developed than the United States, by the way) where voting security and the reliability of the elections are guaranteed with state-of-the-art technology. Among the automation methods that are used for the preservation of the ballot, there are systems that offer voting receipts (like the one in Venezuela, provided by Smartmatic), which allows both the voter to validate his/her vote as well as all those in the polling station to audit the results from any voting machine.